Death and decomposition is the beginning of new life for the many microbes that take over our bodies after we die: an environment known as the “necrobiome.” Jessica Metcalf, assistant professor at Colorado State University, studies these microbial communities and the activity that takes place in and around a corpse. She takes Ed Yong through the stages of decomposition and how the complex interaction of organisms during the decomposition process can produce useful knowledge for crime investigators. Through forensic experiments, Jessica and her team are now able to more accurately estimate time of death by sequencing the DNA from the microbes found on and around decomposing bodies. 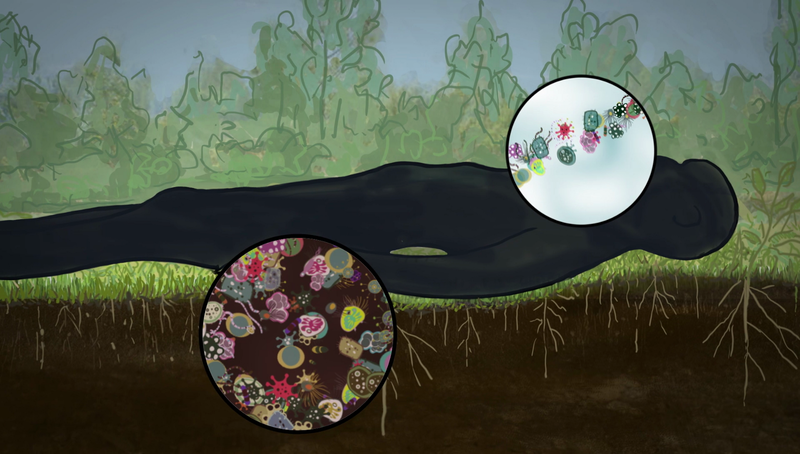 I Contain Multitudes is a multi-part video series dedicated to exploring the wonderful, hidden world of the microbiome. The series is hosted by science writer Ed Yong and produced by HHMI Tangled Bank Studios in association with Room 608.